Often it’s the smallest changes that can lead to the biggest improvements. This kind of change can be made using three affordable equipment upgrades I recommend for any beginner clarinetist (these are also great upgrades for anyone who wants higher quality basic equipment). The main outcome of each of these upgrades is more ease of playing and aid in producing a more beautiful tone. Beginners often start out on student level reeds such as the Rico orange or blue box. These are good choices since the reeds easily allow you to produce a sound that is controlled. When the student gets to the #3 strength Rico reed I like to have them upgrade to the Vandoren Traditional reeds (blue box). These professional quality reeds help produce a warmer, rounder and more focused tone. Since the reeds are thicker, they provide the resistance that’s needed for playing in the high/altissimo register. I’ll often recommend a #2 or #2.5 strength. Note: Reed strengths are not the same across brands and lines. The next item I like to upgrade is the ligature. My favorite for students is the Vandoren Leather Ligature with 3 Interchangeable Pressure Plates. It is a quality leather ligature that with its three interchangeable plates gives you sound production options to play around with. I like to use the metal plate when playing in band/a big concert space. The other two plates I prefer to use for solo/chamber performances and small concert spaces. Depending on the player, one plate might make articulation cleaner vs another. The third item I usually recommend for beginners is a mouthpiece upgrade. The reason I tend to have students upgrade their mouthpiece after their reed and ligature is because I want them to first be able to get the fundamentals of proper embouchure and air speed/support down. The mouthpiece is also the biggest investment out of these three upgrades. The two mouthpieces I tend to like my students try and play are the Vandoren B40(traditional) and M30(traditional). They both provide a warm, round, controlled tone and make it much easier to play into the high/altissimo register. Note: When switching mouthpieces, the reeds you are playing on might not work for the new mouthpiece. Have a couple different strengths/brands available to test out with your new mouthpiece. If you don’t already have a mouthpiece cushion on your mouthpiece, be sure to get one ASAP! They provide comfort, grip for your upper teeth, and help produce a warmer tone. I like to recommend the black .08mm thickness and recommend that my students get them as soon as they start lessons with me. These upgrades will make playing easier and more enjoyable, especially as a beginner clarinetist starts to play music in the higher registers. Reed, ligature, and mouthpiece choice are all very personal and what works for one student might not work for another. These recommendations are based on what I’ve found to be most reliable and successful with my students in my many years of teaching! 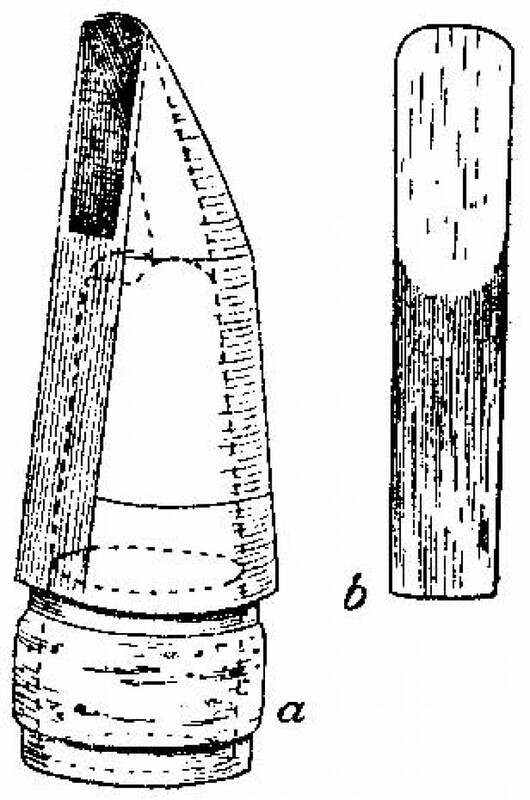 Clarinet illustrations are from the 1911 Encyclopædia Britannica.